This is the Pancake Wheel inventor's blog. The newest entries are here at the top, scroll down for previous blog articles. 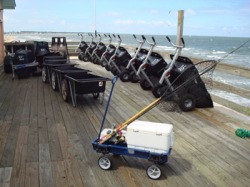 An Update: Summer 2011-What Has Been Going On With Pancake Flat Carts, Wagons? 2. finishing the design of the world’s best, compact fold up solid base metal cart, with two foldup metal uprights, which we call the Pancake Road Warrior Cart/wagon. 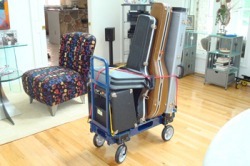 It’s a mult-versatile cart, with two long uprights, so it looks like a smaller version of a luggage cart you see in hotels, but only our road warrior travel cart folds down to 6 inches thin. Its mainly aluminum and steel so very sturdy. The videos of the road warrior cart can be seen here. 3. filed another US patent on the world’s best, compact jogger/jogging stroller designs by Pancake Wheel. The US patent office and China have already granted patent protection on my breakthrough 6 inch thin folding jogger with unique folding jogger wheels. The BIG SECRET? All other joggers besides the Pancake foldup jogger can fold in half but guess what? They are still a whopping 15-20 inches thick unless you take off the wheels. Only the Pancake flat jogger lets you quickly fold your jogger and detach no parts. The brand new US patent I filed recently covers yet another new folding wheel system that cannot yet be disclosed here. Its no secret that it provides a new folding technology innovation though. 4. Discussions continue over licensing my patented and patent pending technology with several companies as well, which I cannot yet discuss here. Thanks for checking out the Pancake Wheel fold flat wagons, carts, joggers and more. We will post news about where our products are for sale on this website. A Short History of Wheeled Carts and Wagons and Fold Flat or Collapsible Features. Pancake Wheel: read our blog on the best, fold up, compact travel carts, wagons, joggers and more! The world’s thinnest folding solid base carts and wagons, over 15 U.S. patents and counting. View all Pancake Wheel’s Youtube videos on fold flat carts, wagons, joggers here.